Anger. Malice. Hostility. Frustration. Violence. Those are just a few of the words that instantly comes to mind as soon as this CD fires off through your speakers and pummels you upside the head with its sheer brutality. 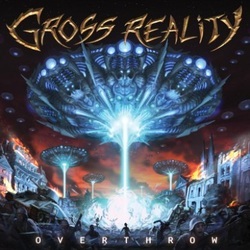 Featuring rapidfire vocals and a relentless thrash gallop, Gross Reality immediately show you that there is no clowning around here. They have something to say and you best be ready to listen! The band has been around in one shape or form since the early 90s and this is their first official debut. Not sure why it took so long for the release to happen but I am glad it is here now. The band are from North Carolina and have appeared previously and currently in various other bands in the area as well. As for the CD, Worthless Humans and Dirt Filled Skulls blitz in at you with a machine gun speed and efficiency and just don't let up for a second. Save Yourself comes in and then they slow things down a bit while keeping the metal amped up, switching the vocals a bit to include melodious slower lines with some rapid fire lines as well. I have to say there is some vibes of a more modern metal in this track than in the previous too, but it is just a glimmer with some of the vocals more than anything. The band does try to slow it down after this a bit and I think they sort of lose their edge when they do. Their fast stuff is definitely much better than their slower numbers, overall, though there are definitely some that stand out better than others. 13 O'clock, I'm Absent and Human Resign are among some of the other standout tracks to be found on this decent if a bit un-even release. If you want some thrash dipped in a batter of anger and mayhem, look no further!